Tej Pratap Yadav Hands Crown To Brother Tejashwi, Asks "What Rift"
RJD leader Tej Pratap Yadav has accused "some people" of trying to create a rift between him and his brother Tejashwi Yadav. Tej Pratap Yadav, the older son of Bihar politician Lalu Yadav, has settled for a back seat in the Rashtriya Janata Dal that his young brother Tejashwi has been leading for some time. But this hasn't been enough to put the lid on speculation over relations between the two. Tej Pratap Yadav made another attempt on Wednesday, this time with a crown that he presented to his brother at a mega event to mark the foundation day of the party father Lalu Yadav had launched over two decades ago. 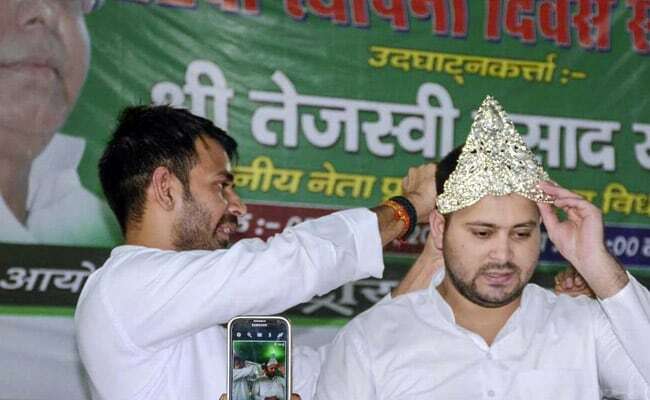 "Tejashwi has a long way to go," the older brother said, before tying a crown with a string . Tejashwi reciprocated by touching his older brother's feet. The public display of mutual respect came against the backdrop of a controversy over the invitation card to the event. Tej Pratap's name was not in the list of dignitaries to the event. That had set off speculation about the rift but Tej Pratap had insisted it was no big deal, pointing to his photographs in the posters and banners for the event. It is Tejashwi Yadav who has been seen as Lalu Yadav's political heir for years. When the RJD came to power in 2015 as part of the grand alliance with Nitish Kumar's Janata Dal Secular and the Congress, Lalu Yadav had got the younger, but politically savvy Tejashwi appointed as the Deputy Chief Minister. Tej Pratap had to settle for the health ministry. Before Lalu Yadav went to jail last year, he had made it clear that it was Tejashwi Yadav who would assume the leadership role. It is a role that Tej Pratap Yadav, who has played a supporting role to his articulate brother, has resigned to. But he has accused people in the party and outside of trying to drive a wedge between the brothers. Tej Pratap has also complained that people in the party didn't listen to him. Last month, he had also tweeted his retirement from politics but withdrew this announcement within hours, contending that he was there to stay. A few days back, Tej Pratap blamed the BJP for hacking into his Facebook account and uploading a post about his retirement that was designed to create a rift in the family. Tej Pratap did not touch upon these controversies in his brief remarks at Wednesday's event but asserted that "some people were jealous" and were trying to divide them.